No, I am not trying to summon the dead, lead the gospel singing or appeal to the Almighty*. This is me attempting to impart some words of wisdom to those gathered at the Poetry Cafe in Covent Garden yesterday evening. I was there at the invitation of Agnes Meadows who is the power behind Loose Muse – a monthly gathering of women poets and writers (tho’ I did spot a chap or two) – and apart from getting drenched on the way, a very nice time I had too. 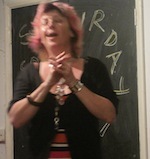 Further details of these events at www.loose-muse.com and http://www.poetrysociety.org.uk/content/cafe. You can sign up to receive these blog posts by clicking on the ‘Follow’ button… also follow me on Twitter (Jane Wenham-Jones), Twitter (Wannabe a Writer), friend me on Facebook, connect with me on LinkedIn. I’m also on Goodreads, Greatvine, Love Reading, and have two other websites http://www.janewenham-jones.com and http://wannabeawriter.darkskipper.com. My books are available from Amazon.co.uk, Amazon.com, Amazon.de, and Amazon.it. Other sites I’m involved in are listed here. Previous Post Fifty Shades of Wot?